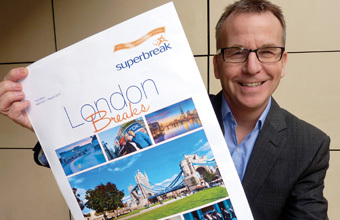 SUPERBREAK has launched a new London breaks brochure, featuring a range of tours and packages for visitors to the capital. New shows, concerts, exhibitions, events, tours and sightseeing options have been added to ensure agents have the very latest products to sell. National sales manager Graham Balmforth said: "Post Olympics we are confident that the extensive media showcasing that the city received will drive demand for 2013, which agents need to work hard at capturing. There really is something for everyone and there are some amazing new packages to push this year. I have no doubt Charlie and The Chocolate Factory and the Book of Mormon will be huge sellers and The View From The Shard is already proving very popular."